New iterations feature an evolution of Kodo design. The new Mazda3 sedan features a "matured" version of the brand's Kodo design language. 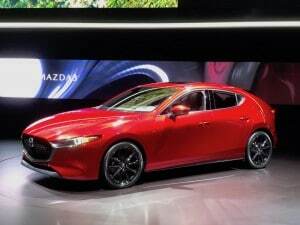 No fireworks were necessary for Mazda Motor Corp.’s debut of the new Mazda3 as the Japanese automaker introduced a refined, “matured” version of the brand’s entry-level sedan and hatchback in Los Angeles. The automaker’s “matured Kodo design language” was on full display. The company’s been using the design philosophy for its exteriors for years now. It’s aim is to present clean and contemporary looks that aren’t quick to go out of style. “While the overall form presents a simple, single motion, subtle undulations bring the design to life through shifting light and reflections that glide over the body surface. The result is a richer and more powerful expression of vitality than previous Kodo models,” according to the automaker. 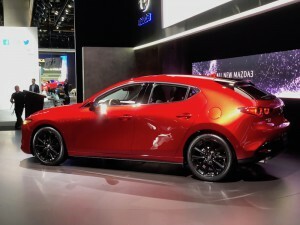 However, there are differences between the hatch and sedan, according to Mazda. They have distinct personalities — the design of the hatchback is emotive, the sedan elegant. Another thing that hasn’t changes is that both models use Mazda’s new Skyactiv-Vehicle Architecture, designed to enable people to make the most of their natural sense of balance. The powertrain line-up comprises the latest Skyactiv-X, Skyactiv-G and Skyactiv-D engines. The company has sold 6 million Mazda3s since its debut in 2003. These powerplants are designed to provide “responsive speed control in any driving situation.” Mazda is looking for all of its models to be driver’s cars, an extension of the person behind the wheel and to that end, the company has beefed up its handling performance. Unlike many other automakers, Mazda is firmly behind its line-up of sedans and hatchbacks. The company has sold more than 6 million Mazda3s since it debuted in 2003, and the company – despite having several crossovers in its line-up – has no plans to stop selling it anytime soon. “The all-new Mazda3 we unveil today begins a new era for Mazda,” said Akira Marumoto, Mazda’s Representative director, president and CEO. This entry was posted on Thursday, November 29th, 2018 at and is filed under Asia Pacific, Auto Shows, Automakers, Automobiles, China, Europe, Executives, Los Angeles, Markets, Mazda, NAFTA, Personalities, Sales, Sedans, South America, Trends, U.S./North America. You can follow any responses to this entry through the RSS 2.0 feed. Both comments and pings are currently closed.